Protect all your devices for $37. Antivirus isn’t as big a deal as it once was for Windows users. Yet even with Windows Defender baked into Windows 10 it’s still worth it to have a third-party antivirus suite with more robust features. Right now, there is a fantastic deal on our favorite antivirus suite for 2018. Norton Security Premium is just $37 for a one year license covering 10 devices. That's a whopping $73 discount. The regular price for 10 devices from Norton is $110 per year, with a first time customer introductory price of $55, and we heartily recommend it even then. This particular offering from Amazon digital services (meaning it’s a download and not a boxed version) has been bouncing around all month from $74 down to the current price. Norton may be an old brand in the world of antivirus, but it’s still one of the best. In our tests, Norton Security Premium didn’t have a big impact on system resources and does a great job of protection. The interface is also very easy to understand and navigate. 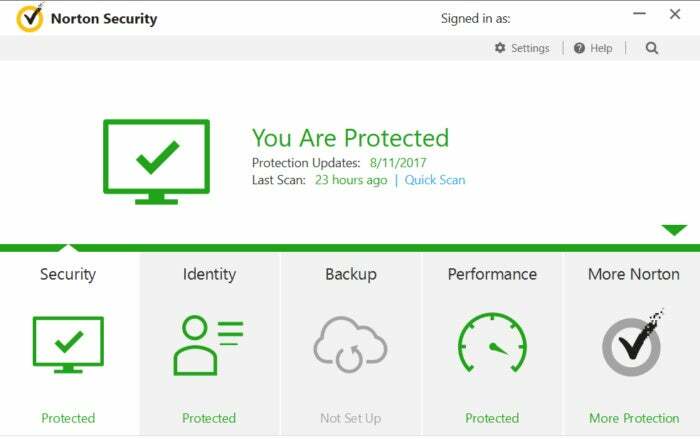 This is Symantec’s top-level security suite with helpful features like parental controls, secure back-up, and Norton’s cloud storage. With a 10-device license you can cover all the PCs in your house with enough space left over for your mobile devices, too.